Situation: While the world goes crazy over Black Friday and Cyber Monday sales, there is another global movement that’s in the true spirit of the season - #GivingTuesday. This global day of giving and philanthropy kicks off the end-of-year charitable season with a 24-hour giving event fuelled by the power of social media and collaboration. In previous years, #GivingTuesday has provided a great opportunity for PetRescue to raise funds at their busiest time, when thousands more homeless pets are in need of a new home. But in 2018, PetRescue had the added advantage of a $10,000 gift matching pledge from Moose Toys and their Scruff-A-Luv brand. Deliverables: In the weeks before Jo left her role as PetRescue’s Fundraising and Brand Development Lead to return full time to Caboodle, she was tasked with formulating a campaign strategy, concept and content plan to leverage the Moose Toys gift matching offer. Jo worked with the PetRescue team to develop a 48-hour gift matching fundraiser to coincide with the global #GivingTuesday event. This multi-channel digital campaign featured a customised, mobile-friendly donation pop-up on the PetRescue website, as well as email marketing, a press release and SMS reminders. 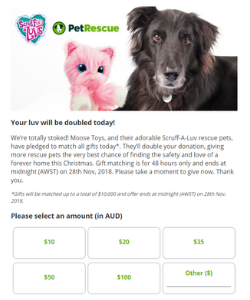 This ran in tandem with a 48-hour online treasure hunt promoted via social channels - giving visitors to the PetRescue website the chance to find and win Scruff-A-Luvs, also kindly donated by Moose Toys. Result: The fundraising target for the 48-hour event had been set at $20,000 (including the $10,000 matched gift from Moose Toys). Within 24 hours, that target had not only been smashed, it was doubled, and the gift matching campaign was closed. More than $20,000 in donations were received on #GivingTuesday, making a campaign total of over $30,000, which goes to help 3,000 rescue pets (a third of the total listed for adoption on the day) find the love and care of a new home. The online treasure hunt ran for the full 48 hours, resulting in 15 lucky Scruff-A-Luv winners, a 23% increase in web traffic. Find out more about our charity and fundraising copywriting experience, or contact our freelance copywriters to discuss the messaging and strategy for your next fundraising campaign. When a client likes your messaging work so much, they can’t decide.